Can You Handle Being on Stage as a Leader? Beth Armknecht Miller is a Vistage Chair in Atlanta who provides a great role model of leveraging social media to create a personal brand around being a Vistage Chair. She does a great job using social media tools to amplify her message as a Vistage Chair in her community. One of the blogs I follow is the Great Leadership Blog by Dan McCarthy. I stumbled across this guest blog post by Beth on that blog titled “Don’t Let the Pebbles Cover the Rocks“. Beth talked about the importance of not letting the urgent overwhelm the important in this article. If you’ll remember the writings of Steven Covey in the Seven Habits of Effective People, this was one of the key downfalls of most individuals – they let the urgent dictate their lives. And finally, having the skill to manage your emotions in times of the urgent is critical to leadership success. Many leaders forget that they are “on stage”. Their employees are always looking to them for emotional and behavioral cues. So when something or someone becomes that pebble, you need to kick up your level of emotional intelligence. Step back and think before you react. I realized that the girls who played for me looked to me for guidance, inspiration, and focus. The lessons I’ve learned from coaching have helped me in my personal business, executive search practice, and in coaching my clients to be more effective in retaining top talent. Very few basketball coaches have good control of their emotions and are able to effectively communicate with their teams. Their style is measured in extremes – from pure joy to outright anger. They talk about being ethical and value-based in their style out one side of their mouth, and out the other side swear at their players, abuse the referees, and trash talk the opponents. I have to ask myself what type of contradiction that sets up in the minds of young student-athletes. Perhaps, it prepares them for a lifetime of abusive and terrible bosses. Is there a significant difference in this aberrant behavior by coaches of high school girls vs. CEOs at entrepreneurial companies. Why is that other coach yelling at his team? Can you believe what that coach just said to the referee? How about that parent behind us who just yelled that comment – isn’t that inappropriate? Coach Barry – when you sit down on the bench we feel you’ve given up on us. My coaching peers frequently ask me why I don’t yell at the referees when I am upset about their calls. I tell them that the referees are doing their best job and sometimes they make mistakes under difficult situations and pressure. I ask them how they would feel if I yelled at them every time they made a mistake. Top talent will not put up with a boss who cannot control their emotions. Members of a sports team will stop working hard when they don’t trust or believe in their coach. Employees are no different. If you’re going to be a “nut-case” and not coach/manage from a values-based approach all the time, then you should just forget about ever retaining top talent. One of the top 3 reasons top talent decides to leave is that they lose their trust in you as THEIR leader. Not being able to control your emotions and not being able to “walk the talk” of your values is one of the fastest methods to lose good people. How many of your managers and executives have no clue how to manage with values and control their emotional state? Are they capable of learning? Should you send them to charm school? OR is it time to move on and hire better managers. You managerial and supervisors will dictate the caliber of team that delivers the front line of your service. If you’ve got “BAD” managers in those roles, you’ll never achieve long term continual success since they will only be able to hire and retain average and mediocre candidates who can’t find a job elsewhere. Have you ever played on a team for a coach who couldn’t control their emotions – have you ever worked in an environment where the CEO or manager couldn’t control their emotions? What did you do about it? My experience is that the entire culture/style/values of the team, group, department, or organization is set by the coach or leader? Do you have managers in your organization contributing to dysfunction? David Zinger is another of my favorite bloggers with great insight to improving employee engagement, culture, satisfaction, and commitment. He writes a Blog titled “David Zinger Employee Engagement“. In a recent blog posting, David writes about Adam Bryant’s weekly column in the Sunday New York Times called “Corner Office”. Adam interviews various CEOs and Presidents in his weekly column on topics of leadership. In one of these columns, he interviewe arbara J. Krusiek, CEO of the Calvert Group on Career Ladder? It’s Time for a New Metaphor. I would highly recommend reading the blog posting or the original article in the Corner Office Column. There are a few great nuggets to take back and think about implementing within your company to improve employee engagement, excitement, passion, satisfaction – not to mention retention. What’s your version of HR Insanity? Evil HR Lady is one of my favorite blogs to follow. Suzanne Lucas, the funny and sometimes frank HR Guru behind Evil HR Lady, recently wrote on her blog asking for samples of Your Favorite or Least Favorite Policy. I almost doubled over in laughter reading some of these Dilbert-ish comments. What are the tribal policies that are in place in your company or organization that make you want to go home and either laugh till you cry, or cry while pounding on the wall? Where do these come from? How many of your employees are turned off to your culture when they hear, read, see policies that have no grounding in common sense. Why do you put policies in place that cause your employees to question your sanity? File this one under “How I Encourage My Best People to Leave and Join My Competitors”. 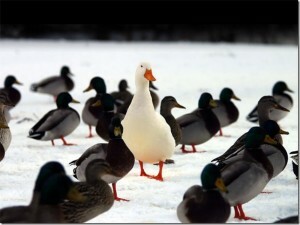 How can you stand out in a crowded sea of other leadership or experts in your field? How can you establish your brand as unique? How do you differentiate yourself to the point where CEOs and executives look forward to your postings since they are so different from all the other generic stuff that everyone else posts in their blogs? Darren Rowse, writing on his blog, Problogger, recently posted an article titled “11 Ways to Add to the Blogosphere and Stand Out From the Crowd“. Actually, it’s a video and Darren once again nails it with actionable tactics you could implement tomorrow to start differentiating yourself as the “go-to” leadership guru/expert in your local community. Are you doing any of the 11 things that Darren discusses in his video? If you’re NOT yet blogging – is it time to start? Should you have a platform on which to establish your credibility, expertise, knowledge, and personal branding? There is no better solution that blogging about what you already know! Are you a member of one of our LinkedIn Discussion Groups for Chairs, Members, or Speakers/Trusted Advisors? See the footer below this post for the links to join these groups and join the discussions of how to build your business – especially through social media and social networking.